I iz at it agen! I fort it woz abowt time me got off me cloud an started raisin sum more money for charity. 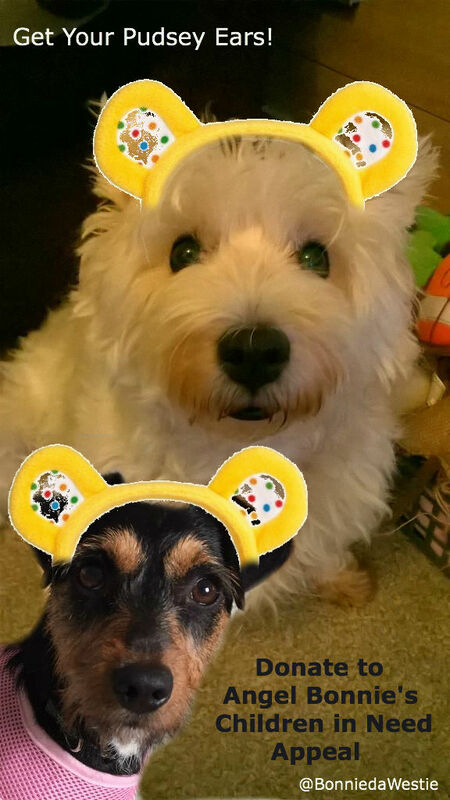 So dis week me iz offering to put Pudsey Bear ears on yoor picfurs if yoo donates £2 GBP or more if yoo want to Children In Need. All da money raised goes to BBC Children in Need, to help wiv all sorts ov fings dat children need, like help wif diffrunt schemes and stuff. Here's da webpage wot tells yoo all abowt it. As you can see dere's lottsa fings da money helps wif, so if yoo wud like to help me raise funds please do. I got til Friday 13th and me wud like to raise £500 or more if me cud, but woteva we raise, it betta dan nuffin an will be gratefully received by da charities. Now torkin ov charity, me is holding a Chrismuss auction dis year, I got a brand new 3ft tall fluffy penguin. Woz given to me to raise money for charity so dats wot me gonna do. *nods* Da best way to do dis is for me to start da auction on Twitta, and for peepul to tweet in reply to original tweet how much dey iz offerin. Den on da closing date da highest bidder gets da penguin. I fink dat fair. As da penguin iz so big, it wud cost too much money to send it out of da UK, so me iz gonna haf to fink ov somefin else for me followers 'abrord'. But me will tell yoo wen da auction is gonna start and put a picfur ov da hoog burd on here so yoo can see him. Muvver sed she be glad to see him go cuz he takin up too much room in da spare bedroom. *rolls eyes* she a grumpy old toad at times bahahahahaha. As for my fing she sortin owt, Bonnie's Rainbow Bridge Fund, fings is moving along slowly. She has now got all da pet crematoriums and cemetaries on file and is busy gaverin all da vets she can as well. Once all dat done, da Fund will be almost reddy. BRFB *wispurs* dats short for Bonnie's Rainbow Bridge Fund don'tcha know, ahem... will be someware for peepul to get advice about attendin dere pets funeral cos dey alreddy pays for it wen dey pay da vets, juz dat vets dunt always know it possuble so dont say nuffin, and also to help anyone wot can't afford a personal cremation or burial can apply to da Fund for part or full payment towards it, and we will den lee-ayz wif dere vet to arrange da financial bit. Sadly financial bit will only be possible for pawrents in da UK, for all other pawrents da Fund can only advise and offer to set up a donation page for peepul to give towards da cost ov da funeral. Muvver sed to tell yoo its gettin closer to becomin active but iz qwite involved. So dats a lot goin on dis munf. Plus dere's Zombie Squad panto comin up, and me got a starrin role in dat, and also me fursibs Mojo, Gizmo, Dora and Lily le Puss are gonna be in it too, so dat gonna be fun. Speshully if yoo iz like me muvver, and will be spending Chrismuss on dere own. Chrismuss on yoo own not much fun, an can be sad and even depressing, but our Twitta fambly will be around to chat to an yoo can take part in ZS panto if yoo in Zombie Squad, or if not, yoo can juz enjoy da fun. I got chat room on dis blog, so mite have set times for evfurryone to meeet up in dere at Chrismuss and haf a quiz or somefing so we all haz a good Chrismuss and not be sad. Well dats all me noos for now pals, so me gonna go an flick duster round da purley gates reddy for da next intake ov furry angels. I bin up ere in heaven 2 months yesterday, an dis furst time me on purley gate duty so better not be late. Time haz flown, an it dunt seem like me bin here dat long, muvver still missin me as much as eva bless her, an me duz keep sendin signs to show her me not forgotten her, me even sent her sisfur Dora who she loves but me can understand dat Dora neva take my place. But I know all dem hoopawrents got big hearts dat love us furs, and dey got room in dem big hearts for more dan one furbaby and dat dunt mean dey love us any less cos we gone OTRB, cos all us furs leave a little bit ov us in our hoopawrents hearts, so by time dat dey come to Rainbow Bridge I reckon dere hearts must be 99% furbaby and 1% hooman. And dere's no finer more honorubble way to honour a beloved furbaby gone ova da Bridge dan to give love and a home to anuvver furbaby. We understand dat, but sumtimes da hoopawrents can't see it for dere grief. I had lots of pals from Twitta join me here da since me arrived, we is all togevva, we haz fun here chasing round and ov corse dere's da eternal sossige tree dat neva runs out of sossiges bol And da wevvas good, it can be woteva yoo want it to be wich is good, cuz one day yoo mite want sunshine and next day maybe sum snow to make snowdogs. Bit like down dere' but more organised. Corse dere hoopawrents iz heart broken an miss dem all terrubly, but we duz show signs if dey keep eye open for dem, da odd white fevva, a rainbow, a favwite toy found in a different place, dat kinda fing. Even a fleetin shadow out corner ov dere eye. We never far away, we just cant be seen cus we juzt here, but you can feel us more dan see us. Dats strong sumtimes, close yoor eyes all yoo hoopawrents dat got furbabies here, and fink ov dem, and I know yoo will feel dem close to you. Well dats all yoo gotta do wen yoo misses us bad. Close yoo eyes and fink ov us and we will be dere wif yoo. And we always watching over yoo too. Waiting til we all togevva agen. Anyhow me is rilly wafflin now so me gonna get gone and get on wiv me werk cuz St Francis ova dere givin me da eyes and I dunt wanna get rong side ov him or me won't get me bacon supper tonight BOL. So be good, stay safe and spread da love my fwends!